Steven (Chicagoland, United States) on 8 January 2010 in Plant & Nature and Portfolio. 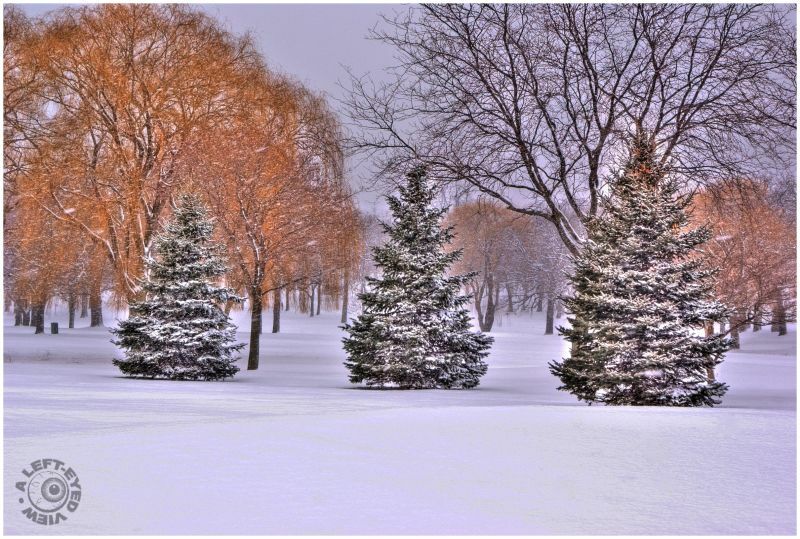 Snow-covered evergreens as captured between the fairways of the 8th and 17th hole of Glen Flora Country Club in Waukegan, Illinois. Photo captured on December 26, 2009. Superb snapshot good shot from view, bravo! A personal opinion I would delete a little forward snow, plan to do a more rectangular format! A family? ;-) Nice winter shot with surprising colours, especially in the broadleafs in the background. De toute beauté. Magnifique prise. Beautiful !!! What a lovely winter scene ! A nice wintry scene. It's interesting that the trees in the background still have some golden color to them. Very nicely done. It speaks "winterrrrr" quite convincingly. @Self-Indulgence: These trees are of the golden variety (Salix alba 'Niobe') of the weeping willow tree, which hold onto their foliage for a long time; one of the last to lose its leaves, just like many of the oak trees around here. Great light and I like this composition with the foreground snow and the evergreens in contrast to the other trees! Fantastic shot.. beautiful winter land..